Sales are up over last year in all three Outer Cape towns for the first two quarters of this year. We can attribute this to high inventory, record-low interest rates and a general sense that the bottom of the market is creeping into our rear view mirror. Also pushing buyers with cash into the real estate market is a volatile stock market. All of these factors have combined to push sales volume up 36% in Provincetown, 102% in Truro, and 26% in Wellfleet. Truro and Wellfleet saw their biggest surge in the sales of single family homes, where Provincetown surged in the sale of single family homes and condominiums. 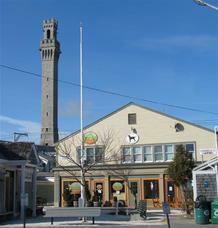 Median sale prices also climbed in Provincetown and Truro for residential properties. Wellfleet traditionally lags the other two markets, as is evident by its statistics. There have been 5 single families over $1M to sell so far this year, as compared with only 3 during the first 6 months of last year. 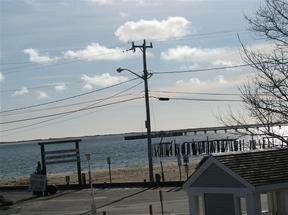 The highest priced sale YTD was a 4BR/3BA waterfront home with 2647 SF for $1,800,000 in Provincetown's far East End. The buyer was represented by Atlantic Bay Sotheby's International Realty. The lowest priced property to sell this year was a bank owned 2BR condominium for $141,000. Last year's lowest priced condominium sold for $91,500. There have been 3 single families over $1M to sell so far this year, as compared with only 1 during the first 6 months of last year. The highest priced sale YTD was a 4BR/4.5BA bay front home with 4786 SF for $2,750,000. 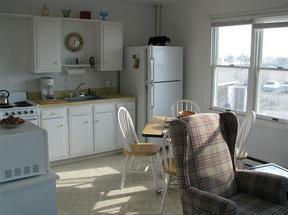 The lowest priced property to sell this year was free-standing seasonal cottage at Salt Air condominiums for $110,000. Last year's lowest priced condominium was a connected cottage for $66,000. There has been only 1 single family home over $1M to sell so far this year, as compared with 2 during the first 6 months of last year. 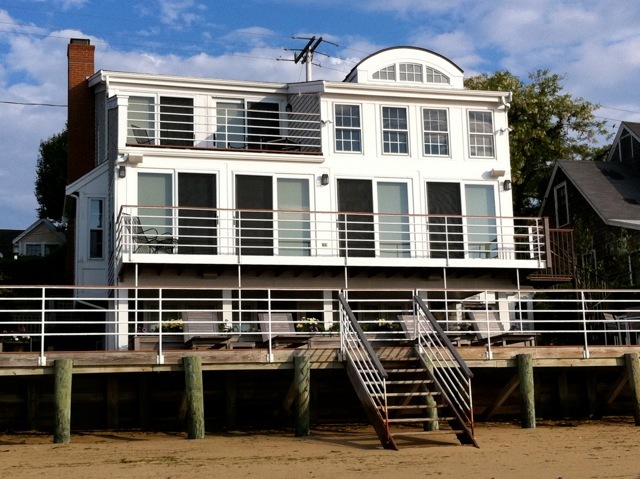 The highest priced sale YTD was a 3BR/2BA bay front home with 3000 SF for $1,150,000. The lowest priced property to sell this year was free-standing seasonal cottage at Pilgrim Acres condominiums for $187,500. Last year's lowest priced condominium was a cottage for $97,500. 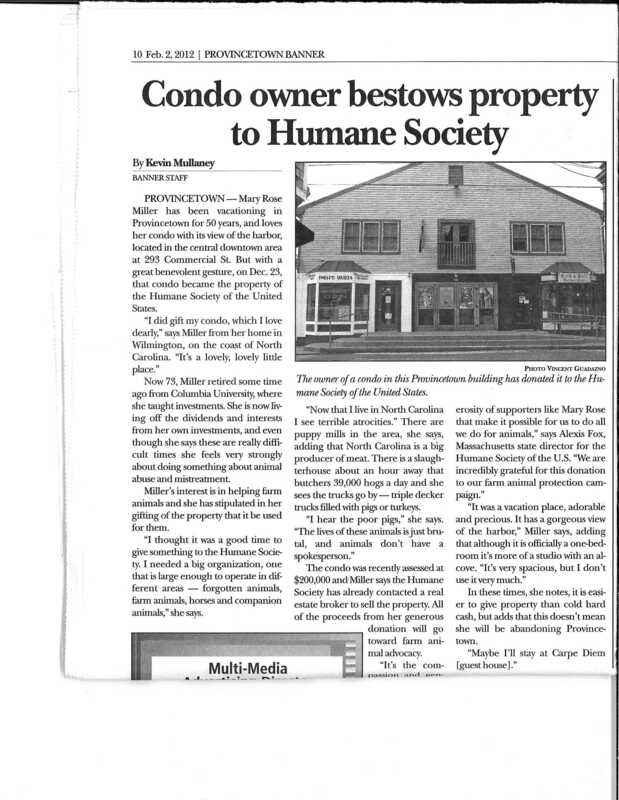 Check out this article about a condominium we have listed in Provincetown that was donated to The Humane Society of the United States. The proceeds from this sale will go toward farm animal advocacy. The perfect in town pied-a-terre! This is a bright and sunny 2nd floor studio unit, located in the heart of Provincetown's downtown district, just steps from the pier. Windows facing south and west offer great light and sweet water views. Located in a mixed-use condominium consisting of 12 commercial spaces and 9 residential. Weekly rentals and pets for owners okay (limit 2 pets). The unit is offered fully furnished and equipped.